Presenting a rose is an age old courting tradition. 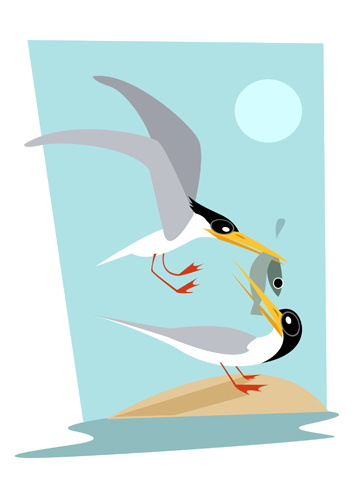 But the male River Tern replaces the obsolete rose with gifts of practical value- he gets her mate her favourite fish! To lure females in the nesting colony, he presents the ladies with his catch of the day. Even after the ‘I-love-yous’ have been exchanged and pair bonds formed, he feeds the female before mating with her. Now that, is gifting like a true gentleman. (Disclaimer- the stunts in this scene have been performed by trained professionals. Imitate at your own risk!) Nothing says, “You make my world spin round” like the male Indian Roller’s courtship display- a series of somersaults performed mid-air, displaying the sparkling blue spots on his wings. This ‘rolling’ display is what gives the species its name. The Roller woman obviously has a taste for raw action, and picks the best stuntman among her suitors. 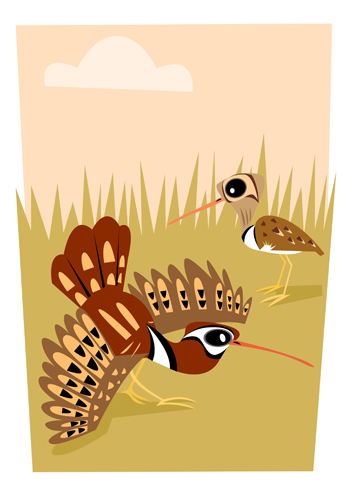 This majestic species of our grasslands puts up a gallant courtship display. After warding off rival males, the male inflates the feathers on the neck which take the shape of a fluffy bag while the tail is held out and raised upright. To make sure that the ladies are watching, he emanates a deep, resonant, booming call that can be heard at a distance of 500 metres! 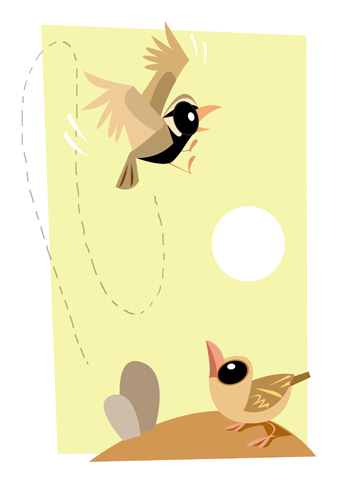 Though a sober bird in appearance, the Sparrow Lark goes to dynamic lengths (heights, actually) to woo his mate. He sings a chirruping song, soaring up to a height, then slowly gliding down with closed wings, and rising up again. The undulating display makes for an engaging crescendo, both for the lady sparrow lark and the bird-watcher. Each time the performer descends, he gives out a long, continuous whistle. 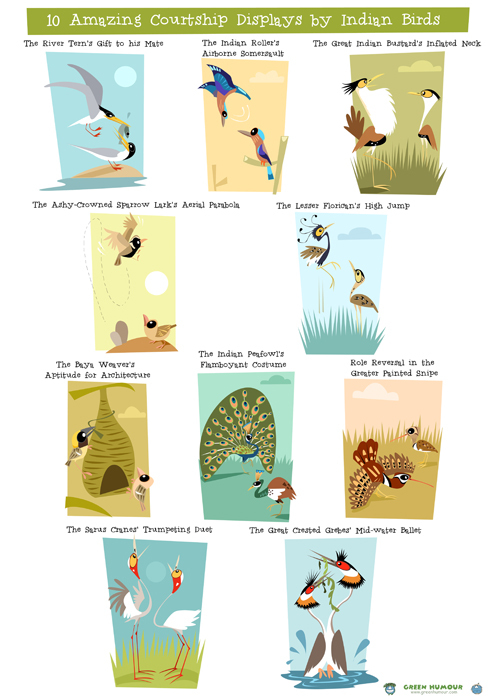 Thankfully, the art of whistling at the ladies is appreciated in the bird world! Floricans live amidst tall grass and the only way to grab female eyeballs in their habitat is the florican’s ingenious courtship display. 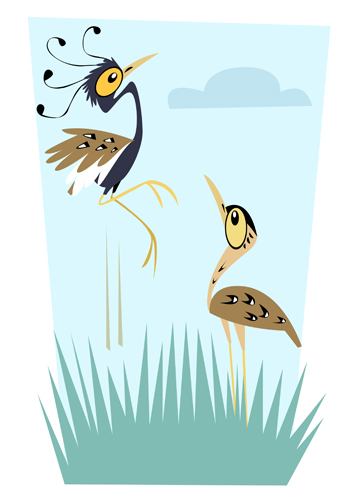 The long-legged male suddenly takes off from the grass vertically upwards, emitting a croaking call, and then falling back. The leap is repeated at every three minutes or so. 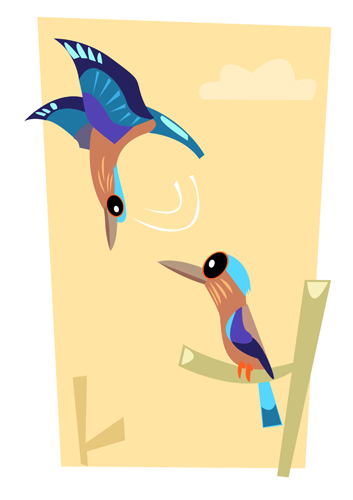 The higher he is able to jump, the fitter he appears to his ladies- a prerequisite to sexual selection. 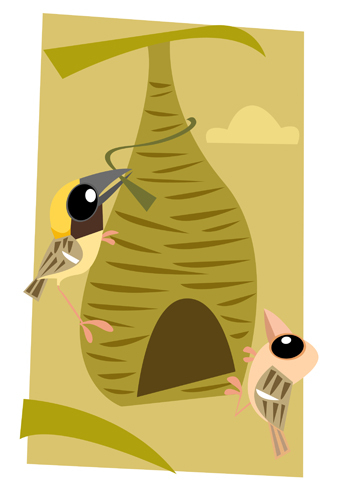 If you are a male Baya Weaver and you do not possess a Masters in architecture, you’re doomed to be a bachelor for life. Famous for building elaborate, pendulous nests, the breeding success of the weaver depends on his weaving skill. The complex nest can take over 500 trips to complete. Once it is partially built, the male begins to advertise by calling out to potential mates. When a female passer-by takes interest, she first carefully inspects the structure, and only if she finds it conducive to raise her young, does she accept the proposal. The rest of the nest is built by the pair together. The peahen has a penchant for gaudy costumes and over-the-top fashion design, and her man does not disappoint her in this aspect. The extravagant ‘train’ of the male is actually comprised of feathers growing from the back, and not the tail, as is the common misconception. This train of feathers marked with colourful ‘eyespots’ is held up and quivered in the famous courtship dance, that has inspired writers and poets for centuries. 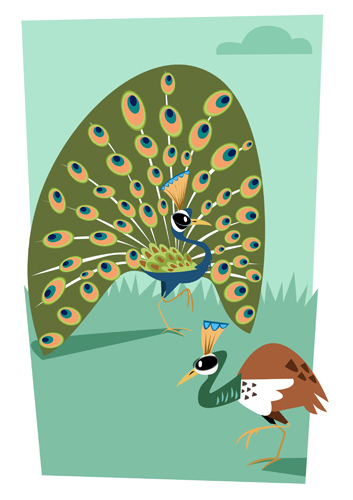 You might look at this dance and think that it’s just another bird borrowing lessons from the peacock, but if you delve deeper, there’s a surprise in store. In this species, it is the female who is the performer and the male, the spectator! The female painted snipe sports the more attractive plumage and her courtship display includes spreading her wings and cocking up her tail. After mating and laying eggs, she leaves the male to look after the eggs and raise the chicks, and repeats the same procedure with another mate. The polyandrous female painted snipe can produce 3-4 clutches in a single breeding season, all looked after by her ex-husbands! It is no surprise that one of the most endearing courtship dances comes from one of the most elegant birds in the sub-continent. 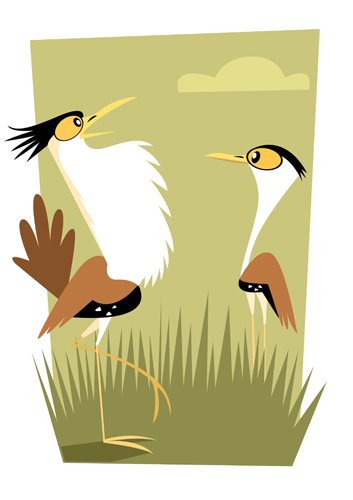 The chivalrous male Sarus initiates the duet by holding his wings out and inviting his partner to join, emitting a loud, trumpeting call that resonates across the grassland. Once the female joins, a remarkable performance of song and dance ensues. 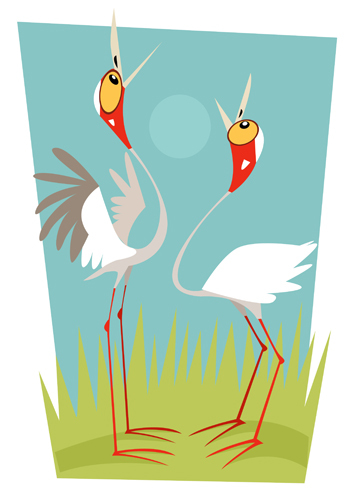 Sarus cranes mate for life and are revered as a symbol of marital fidelity in India. 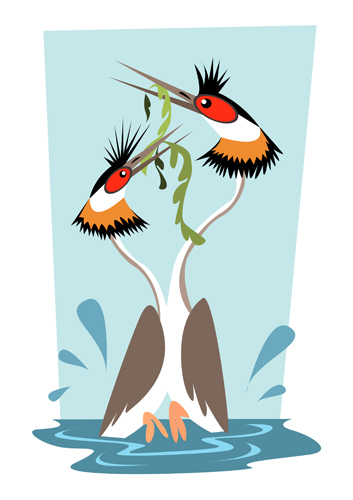 I have a habit of saving the best for the last, and my show-stopper for today is the Great Crested Grebe. Grebes are freshwater diving birds that feed on fish. Their courting dance is one of the most remarkable avian performances, in which the pair first dives into the water and emerges with plucked seaweed in the beaks. Then the male and the female come together, press their breasts against one another and rise vertically from the water, paddling furiously with the feet. While this happens, the couple gently nudges one another with the seaweed held in the beak! Now that’s taking Pas de deux to another level! The series was first published on National Geographic Traveller in 2015. Prints of the illustrations are available as a poster on my webstore here. For orders within India, write to me on rohanchakcartoonist@gmail.com. Truly brilliant depictions of the interesting varied courting behaviour with fitting narratives! Awesome work. Always admire your unique skills of communication.